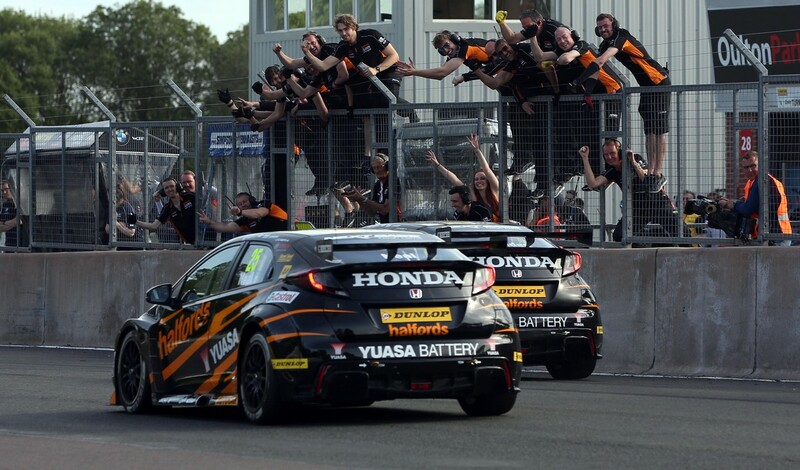 Reigning Dunlop MSA British Touring Car Champion Gordon Shedden kept his title defence firmly on-track at Oulton Park last weekend (20/21 May), as a season-best points haul for team-mate Matt Neal vaulted Halfords Yuasa Racing to the top of the Teams’ table. The squad travelled to Oulton in cautious mood, mindful of the fact that the picturesque Cheshire circuit tends to favour rear wheel-drive machinery – and a high-speed accident for Shedden in the second free practice session added to the uncertainty, with plenty of work to do ahead of qualifying less than three hours later. A herculean repair effort enabled the Scot to secure a strong seventh spot on the grid, but it was team-mate Neal who stole the headlines by annexing a second consecutive pole position – for the first time since 2011. In race one, the three-time champion had to give best to the fast-starting rear wheel-drive BMW of Andrew Jordan at lights-out but thereafter kept the leader honest throughout, setting fastest lap along the way. Shedden was part of a multi-car scrap over third and eventually brought his battle-scarred, ballast-laden Civic Type R home in seventh as his two key title rivals both failed to score. In the second outing, the Honda duo worked in tandem to progress up the order, demoting Jordan in quick succession with a neat double move that began on the run to Old Hall and ended at Cascades, going on to take the chequered flag third (Neal) and fourth (Shedden). In the reversed grid finale, the Halfords Yuasa Racing team-mates made light of their success ballast, working together again to fight their way past pole-sitter Josh Cook before setting their sights on Jordan in the lead. After a mid-race safety car period bunched the field right up, Shedden prised the top spot away with a brilliant late-braking manoeuvre on lap 15, as the opportunistic Neal followed through to complete a commanding one-two finish. The results see Shedden reclaim the championship lead – 16 points ahead of his nearest pursuer – with Neal advancing two positions to fifth. Halfords Yuasa Racing has moved to the top of the Teams’ classification, as Honda closed to just eight points shy of the summit of the Manufacturers’ standings.